Match ends, Manchester United 4, Bournemouth 1. 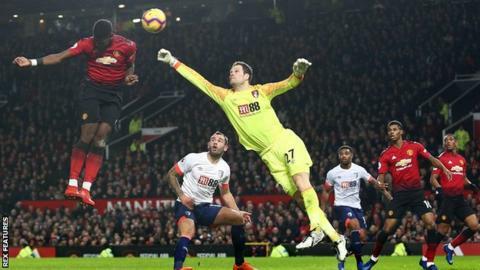 Second Half ends, Manchester United 4, Bournemouth 1. Attempt blocked. Paul Pogba (Manchester United) right footed shot from the left side of the box is blocked. Assisted by Nemanja Matic. Attempt missed. Andrew Surman (Bournemouth) left footed shot from outside the box is close, but misses to the right. Assisted by Ryan Fraser. Substitution, Manchester United. Phil Jones replaces Anthony Martial. Substitution, Bournemouth. Tyrone Mings replaces Nathan Aké because of an injury. Eric Bailly (Manchester United) is shown the red card. Attempt saved. Luke Shaw (Manchester United) left footed shot from the centre of the box is saved in the centre of the goal. Attempt saved. Paul Pogba (Manchester United) right footed shot from outside the box is saved in the bottom left corner. Assisted by Jesse Lingard. Goal! Manchester United 4, Bournemouth 1. Romelu Lukaku (Manchester United) right footed shot from the centre of the box to the bottom left corner. Assisted by Paul Pogba with a through ball. Corner, Bournemouth. Conceded by Eric Bailly. Attempt blocked. Joshua King (Bournemouth) right footed shot from the centre of the box is blocked. Assisted by Steve Cook with a cross. Substitution, Bournemouth. Ryan Fraser replaces Callum Wilson. Attempt saved. Marcus Rashford (Manchester United) left footed shot from the centre of the box is saved in the centre of the goal. Assisted by Paul Pogba with a through ball.